If you have been on a Rotaplast mission, or even just seen photos, you are familiar with the image of a child, fresh out of surgery and wrapped in a beautiful handmade quilt. After surgery, this is the first moment the mother has seen her child since she anxiously watched them leave for surgery. Tears of joy fill the mother’s eyes seeing first-hand the life changing surgery her child has just received. The thoughts of new beginnings brighten the mother’s soul just as the cheerfully colored quilts brighten an otherwise mundane recovery room. This vivid image that sets a Rotaplast mission apart from other surgical projects like it would not be possible without the quilters of Wrap-A-Smile. Since 2001, Wrap-A-Smile has hand crafted stunning children’s quilts for Rotaplast to send on missions. 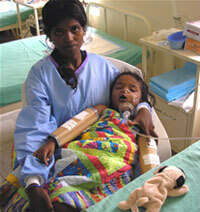 Each child that is treated on a Rotaplast mission takes home a beautiful quilt of his or her own. These quilts provide not just warmth, but also allow children and their families to take home a token of love to remember the day they were given a new smile. Each year, Wrap-A-Smile provides Rotaplast with more than 1,500 quilts to bring to 48 rotating sites worldwide. 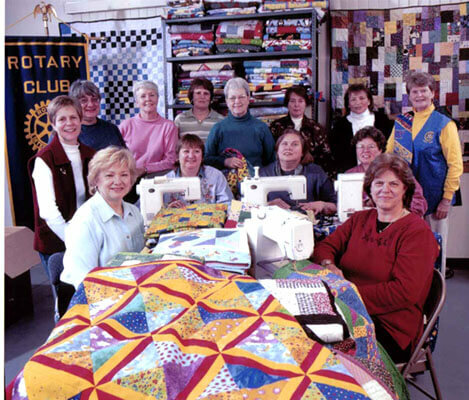 Wrap-A-Smile coordinator and founder, Terry Hodskins, began the quilt project on behalf of Wells Rotary Club and has seen it expand nationwide. In 2006, Terry Hodskins, was recognized by Rotaplast with a Distinguished Service Award for her wonderful commitment and support of Rotaplast’s mission. The project would not be successful without her leadership and the hundreds of quilters throughout North America supporting her. If you are interested in becoming a Wrap-A-Smile quilter, or if you would like to form a quilting circle in your area to support the Wrap-A-Smile project please contact Pete Ogilvie. 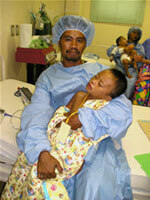 Rotaplast is very thankful for its Wrap-A-Smile volunteers like those featured in the photo below.